As your buddy ages, he may develop myriad lumps and bumps, especially on his chest, belly and sides. Fortunately, these scary, often unsightly bumps have a good chance of turning out to be non-cancerous lipomas. Lipomas are relatively harmless fatty cell tumors often found in senior dogs and overweight females. Lipomas are benign tumors made up of fat cells and fatty tissue that develop subcutaneously (just underneath the skin). They are locally invasive and mesh with surrounding connective tissue such as muscle or tendon. Lipomas vary in size. Some are no bigger than a lima bean, while others grow to the size of golf balls or even larger. It's important to routinely check your dog for lumps and bumps, and take him for a checkup with your veterinarian if you discover any masses. Dogs generally don't exhibit any outward symptoms when affected with a lipoma unless the lump is in an area that restricts movement, such as the armpit. In that case you may notice limping, a strange gait or uncomfortable squirming when sitting or lying down. Most often, owners discover lipomas during grooming or cuddle time when they feel a soft, squishy lump on their dog's body. Lipomas feel soft, like a cooked lima bean, and will seem to float or move around a bit underneath your dog's skin. They are often located on the belly or chest, but can occur anywhere on your buddy's body. Though the precise cause of canine lipomas is unknown, they appear to be part of the natural canine aging process. Just as humans tend to develop wrinkles as they age, so do canines develop squishy lipomas. Overweight middle-aged and senior dogs, especially females, are particularly prone to develop lipomas. Obese dogs have a larger number of fat cells, the building blocks of a lipoma, making them the perfect host for the malleable masses. 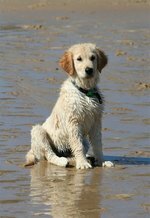 Certain breeds, such as Doberman pinschers, miniature schnauzers, cocker spaniels, Weimaraners, Labrador and golden retrievers as well as mixed breeds appear to be at greater risk for developing lipomas as they age. A rare form of lipoma, diffuse lipomatosis, affects Dachshunds and is characterized by prominent folds on the neck and chest (see ref 3). It's important to check lipomas for any growth or changes, but if the diagnosed lipoma stays the same, most veterinarians choose the non-invasive watch and wait approach (see refs 1, 2, 4 and 5). However, if the lipoma causes discomfort, restricts your buddy's movement or begins growing, veterinarians often recommend surgical removal (see refs 1, 2, 3, 4 and 5).